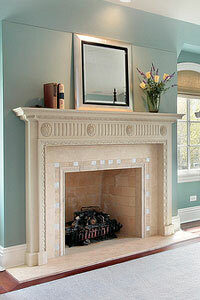 Imagine – a stately marble fireplace, crackling logs, a soft, warm glow. 31-W Insulation can help you create this cozy scene for your Louisville home. As the premier provider of home improvement products and services in the Southeast, we install impeccably designed marble fireplace surrounds. Crafted according to old-world specifications and supplied by the renowned marble company ICM Marble and Granite, these surrounds can enhance your household’s comfort immeasurably. To ensure that your new marble fireplace becomes the focal point you envisioned for your home, only our experienced and factory-trained technicians – not subcontractors – will perform the installation. They will keep their work area tidy and clean up thoroughly when the project is completed, leaving you with a new marble fireplace that will function exactly as designed. For more information about how we can provide you with a lovely new fireplace for your Louisville home, contact 31-W Insulation today to schedule a consultation.